I headed north for a solo hike of Mt. Mitchell in the state of Washington. I’d heard it was a moderately challenging hike with excellent summit views, although I wasn’t sure what it would be like with snow on the ground. Getting to the trailhead was a little adventurous but my little car made it out there just fine. The gravel road was rutted and coated with slush and snow. I was happy to park and start walking. At once the trail was dotted with snow. It was thick, heavy and sticky snow. It didn’t take too long for the snow to get thicker and thicker. I was glad I packed my snowshoes and poles! After about an hour of hiking I broke into my first view, which was…socked in. A dense cloud covered the area, leaving not even a speck of sky to speak of (say that five times fast). No one had been up here recently. I was putting in fresh tracks all the way up the trail. I stopped occasionally to catch my breath and admire the beautiful scenery. 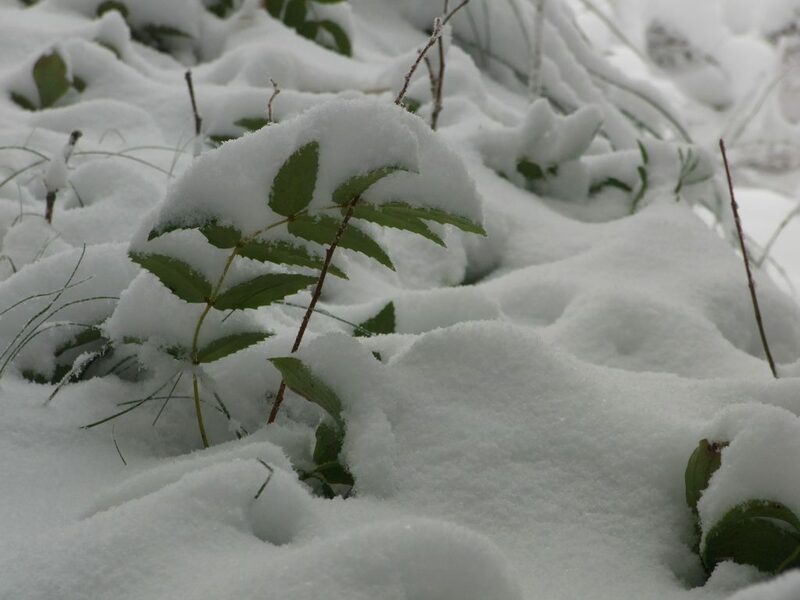 The way the snow clung to each leaf, branch, berry, pine needle…it was just so picturesque. About two hours in I reached a broad meadow filled with beargrass stalks. This must be absolutely stunning when it’s in bloom. It was still pretty today, the plants decorated with snow. After the meadow, the trail ran underneath a rocky outcrop. 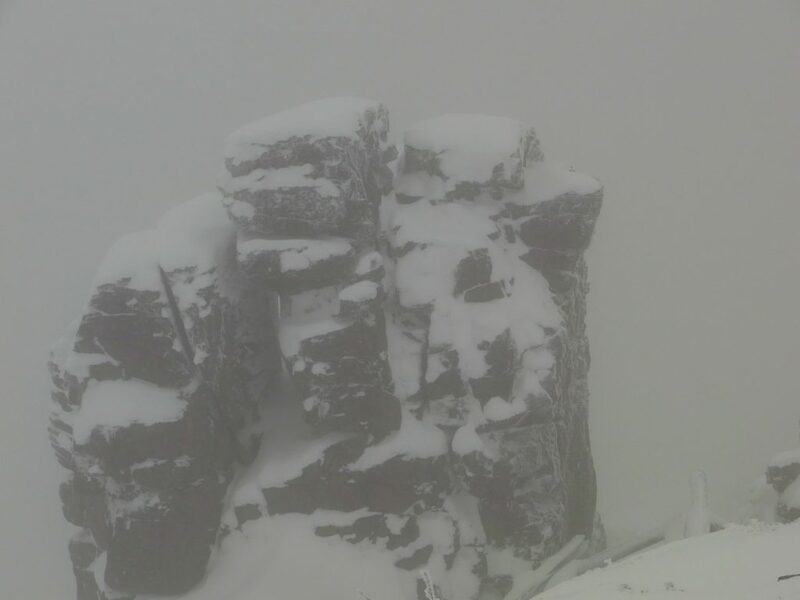 Snow drifts obscured the landscape below. And the exposed, windblown faces were much more icy than the soft snow I was dealing with in the forest. 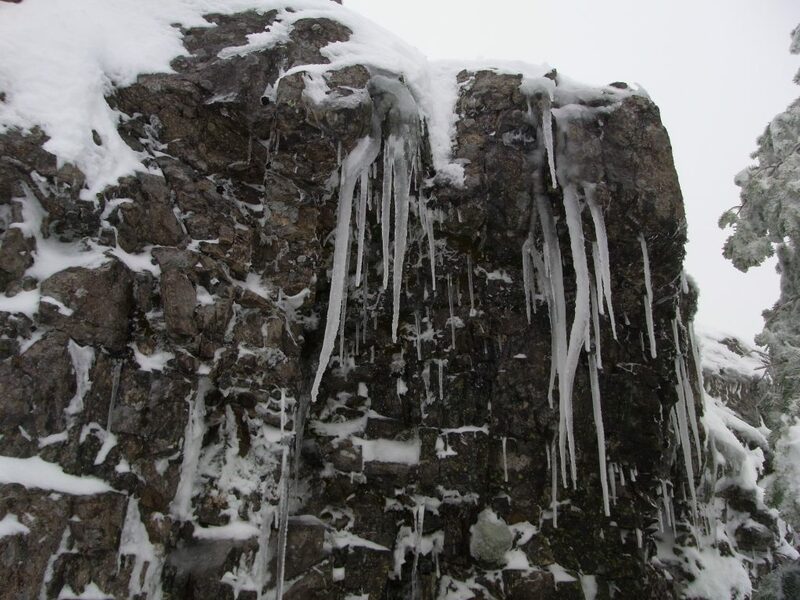 Icicles hung from the rocks like teeth. The clouds thickened and swirled above my head. Was this a preview of the winter to come? It’s not even Thanksgiving yet! At last, the rocky summit of Mt. Mitchell stood before me. I scrambled up to the top and imagined the view. I couldn’t see 5 feet in front of my face. I was completely surrounded by white. It was a little eerie, not having much sense of up, down, left, right. Small portions of dark rock stood out in the almost totally white expanse. No need to dally up here. I just came to check a box and get on with it. In a little over an hour I was back down to the car. The road had melted out a little bit, with two clear tire treads in the snow to lead me out. Today was a truly fun adventure. No serious routefinding, but I did have to make my way through fresh snow all day. A little sting from the cold weather on the upper part of the hike reminded me to get my winter gear ready! 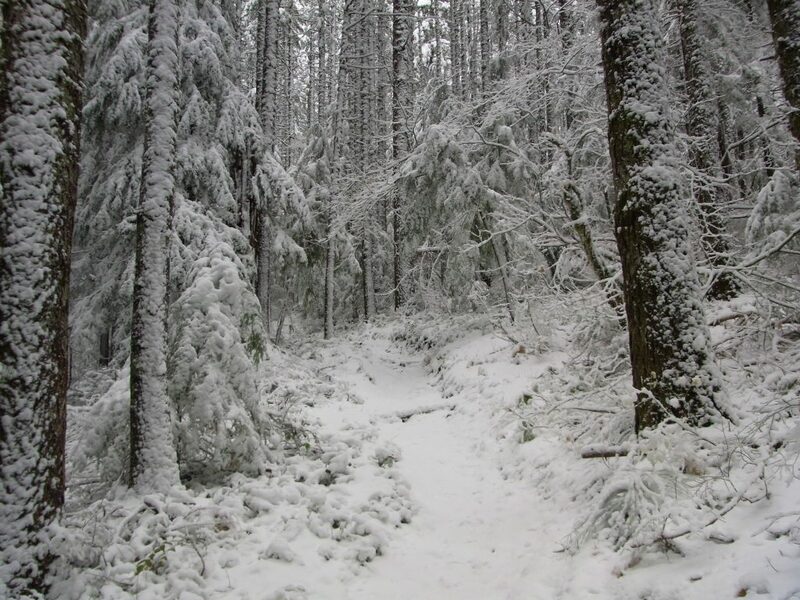 This entry was posted in Hiking, Washington and tagged hike366 on November 14, 2009 by Jess B.